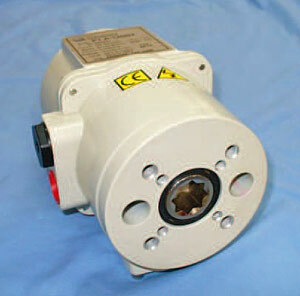 An electric actuator designed for load requirements of up to 445 in lbs. The actuator comes standard with two auxiliary switches (shared common, rated at 3A 250V Max), an internal low power heater, a NEMA 4X environmental rating, and in 12 VAC/DC, 24 VAC/DC, 120 VAC or 230 VAC supply voltages. The P1.A mechanical connections are ISO5211 compliant, utilizing an F07 bolt pattern and an 8 point 17 mm female drive. 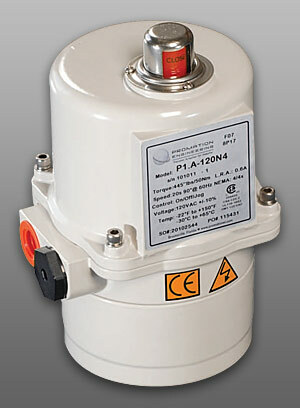 The P1.A Series can be ordered as an on/off or two position model that can also be used in bump/jog applications. It can be ordered with an internal proportional control card that accepts a wide range of control signals and generates multiple feedback signals. This series is available in two different models: The P1.A has built-in manual override capabilities utilizing a 5 mm side-mounted hex key socket, while the P1.A-XOV has no provisions for manual override capabilities.